One wearies of lamenting the government’s inability to view proposed paths of economic development from the perspective of climate change. But as they continue to trumpet economic solutions which are inimical to facing the challenge of global warming there is little option but to keep reiterating that they need to take a longer term view. “New Zealanders, mostly, understand that while we owe it to future generations to do everything we can to protect our environment, we must also do all we can to leave them with a robust and sustainable economy where they can expect a good job and a good standard of living. When Key talks about protecting our environment he is obviously not considering the global environment on which human life depends. He’s talking about the local environment. But my concern in this post is not local environmental threats, serious though they often are, but the global threats which are consequent to the mining of fossil fuels. These threats are never even mentioned in the current government campaign to attract mining exploration in New Zealand and its large area of surrounding seas. The more the threats of climate change multiply and the more evident their first signs become, the more they are ignored in the name of economic progress. Would the New Zealand public really support wider exploration and exploitation of fossil fuels if they knew that the burning of those fuels, no matter by whom, increases the likelihood of catastrophic sea level rise, of dangerous levels of ocean acidification, of much more frequent extreme weather events, of prolonged drought in major food-growing regions, and a host of other impacts highly detrimental to human society? Key talks of our owing future generations “a robust and sustainable economy where they can expect a good job and a good standard of living”. Does he think that can be delivered along with a world in which societies will be struggling with the massive impacts of unrestrained climate change? I presume his way out of that dilemma is to simply tell himself that the predicted impacts are greatly exaggerated, if he actually thinks about them at all. 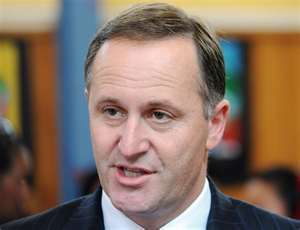 “We in Maoridom must not buy uncritically into the hostile rhetoric from the Greenies. He sees the extractive industries offering the best prospects for jobs and economic advancement for Northland Maori. “There is an ethic of guardianship in our national culture and no one should deny that but there’s also an awareness that each generation has got to create jobs and got to search for ways to create wealth. It is admittedly going to require extensive change for our society to function with greatly reduced reliance on fossil fuels, and the transition can’t happen overnight. But it’s the transition which should be the focus of government attention and support, not the extension of the existing order. It is irresponsible in the extreme to pin New Zealand’s hopes of economic wealth to an increase in fossil fuel exploration and exploitation. It’s a question of direction, and the direction government is currently supporting is wrong and outmoded. So widespread and so apparently nonchalant is the conviction that we might grow rich through oil and gas and coal that one can feel almost stupid for even suggesting that it is a course which should be eschewed in the interests of humanity. But when one looks seriously at what the science cannot avoid predicting it is not stupid to more than suggest, to insist rather, that we must begin to set a limit to fossil fuel exploitation. Most of what remains must be left where it is. That’s the big picture which the government is studiously avoiding and of which it must continue to be reminded for as long and as often as proves necessary.